You know what a major pet peeve of mine is? Smokers who smoke next to “No Smoking” signs, or my favorite, lean against the “No Smoking” sign as they smoke. That does not make you look cool. That does not make you look like a rebel. It makes you look like a jerk. And it is in part because of those of you who do this that a ban of all smoking on campus is being contemplated, meaning smokers will have to go as far as Isla Vista to light up. A smoking ban is being considered for not just University of California Santa Barbara but all UC campuses to save student health and keep the campuses free of litter. The major issue with smoking is that it affects not just the smoker but everyone around them because of second hand smoke. Downing says there have been studies in the last five years that show smoking is “contagious.” People who are around smokers are much more likely to smoke themselves. She says about 16 percent of students at UCSB smoke and that number has been stable for the last five years. That number includes heavy and social smokers. She also warns for social smokers who “only smoke at parties” that nicotine is one of the most addictive substances there is and social smokers very often become addicted and turn into daily smokers. I personally had a friend in high school that used to smoke socially, now he’s a pack-a-day kind of guy. The ban on making UCSB a non-smoking campus came very close to being passed. 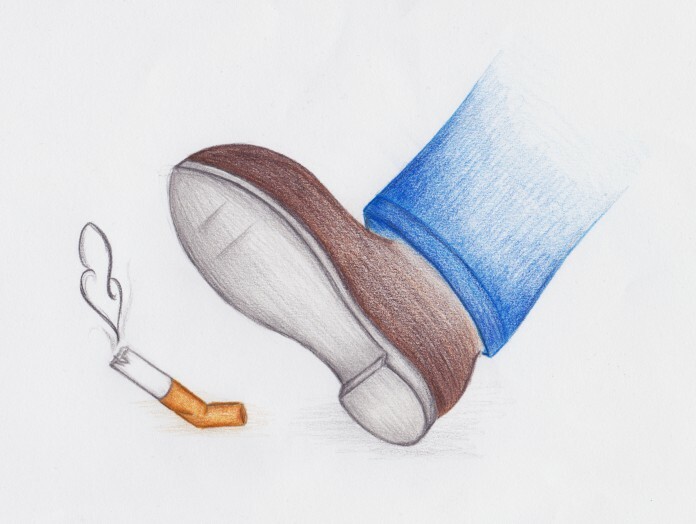 Downing wrote a letter to UC President Mark Yudof, recommending that all UC’s become smoke-free campuses, and all 10 Health Directors from every campus signed it. So then what’s holding it up? Actually, the Human Resources department. Making the campus a smoke-free environment affects not only students, but staff and faculty as well. The system has to make sure that there is nothing in any of the employee’s contracts that states they can smoke at their job and give them time to acclimate. Solutions being considered are making the campus smoke-free, but have certain sanctioned areas where smoking is allowed, like the courtyard in front of Campbell Hall, where there are many events held for the community at large. Downing says this partial ban isn’t good enough, and it’s too much like having no smoking zones that are currently being ignored. I agree. Having a smoke-free campus where you are allowed to smoke doesn’t sound very smoke-free to me. Third-year religious studies major Kaleb Riley supports the ban. “It brings danger to my health and the health of other students and makes a beautiful campus trashed with litter,” said Riley. Ah yes, cigarette butts on the beach. Who doesn’t love that? And I don’t just support this ban because I don’t like breathing smoke, but because I genuinely worry for other’s health; I’ve seen people suffer because of smoking. My aunt Rose developed emphysema after years of smoking, and my uncle Joe developed lung cancer. After you’ve watched someone struggle and wheeze for breath, the thought of that happening to someone else is terrifying. And the worst part is that it’s something we knowingly do to ourselves and is 100 percent preventable. To me, smoking is like breathing death, and I support this ban because at the end of the day smoking hurts people, and while you have the right to hurt yourself, you don’t have the right to hurt others.